One often hears talk how corrupt the government is. Much of the time, what people mean by “corrupt” is “creating-policy-I-don’t-like”. “Policy-I-don’t-like” is bound to happen in a democracy in which the elected party may have different priorities than you do. That’s why you are allowed to get involved politically by writing to your representatives, by rallying people, and by voting. It’s also the reason to consider other electoral forms than first-past-the-post (but I digress). Consider, for example, the past BC government, whose policy amounted to serious mismanagement of BC Hydro and the Insurance Corporation of BC., burdening citizens with enormous public debt that will take years to repay. What corruption actually is, is deceiving the public, or violating procedural laws that are written to prevent conflicts of interest. So while it was not corrupt to manage the crown corporations the way the Liberals did, it was corrupt of them to hide said debt from the public –a subtle difference, but an important one. Using government money to influence local elections as former premier, Christy Clark appears to have done in giving a handout to a school in Haida Gwaii. Using government legislation to nullify a legal contract which was achieved through collective bargaining, which former education minister, Christy Clark did. Covering up or ignoring gang-related activities that are enabled by a crown gambling corporation, as the BC Liberals most certainly did. 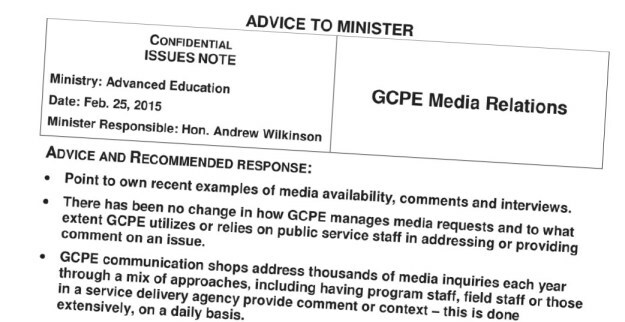 Using Post-It notes to record government business so as to be able to avoid public record (and then engaging in character assassination against the whistleblower), which the BC Liberals did. creating trumped up charges against a team of scientists who innocently report findings that are unwelcome to your big pharma campaign supporters (and then lying about a police investigation),which the BC Liberals did. I suppose it’s a technical distinction. Governments have a moral responsibility to carefully look after the needs of its citizens. In doing so, there will be losers and winners. For example, while the BC Liberals were in power, child poverty increased (so… losers), while corporations got huge tax breaks –not exactly moral governance, though I would hesitate to call it corrupt. Tuesday’s announcement by Petronas that it will no longer pursue liquified natural gas interests in BC represents a failure. The failure was foreseen by many analysts as far back as 2013. It is not a failure of the newly elected NDP government. Rather, it is a failure the NDP warned the Liberals about long ago. Liberal leader, Christy Clark had built her whole 2013 election campaign on a promise of LNG prosperity. She came up with a feasibility report that promised the moon: a trillion dollars and a prosperity fund! And anyone, ANYONE, who dared question this very expensive vision, was howled at: mocked and derided. In fact, the Liberal strategy for the following 2017 election was to frame the NDP as “the party of No”. As predicted, the Liberals’ LNG vision and strategy failed. It was a case of “The Emperor’s New Clothes”. Opposition parties kept pointing out that the emperor is naked (LNG hopes were delusional), but the emperor blithely went on. And now, realizing that she is exposed publicly, the emperor is lashing out: projecting her fury on her detractors with unprecedented vitriol, although in typical fashion Christy Clark has disappeared, leaving the lashing out to her royal guard, Rich Coleman, Jon Yap, and others. There are people, many people, who were very concerned about the harmful process of LNG fracking. Those concerns are legitimate, and a simple internet search can lead you to understand why (Google “fracking”). But the issue of the day is NOT those concerns; it is how the BC Liberals, cynically denied all scientific and economic prognostication and sold BC voters on an LNG-funded utopia. Turns out they might as well have been promising unicorns. Duplicity exposed and confirmed. It’s time for Christy Clark to go. Christy Clark, the premier of British Columbia, is trying to gaslight the public by spinning the recent Supreme Court of Canada decision as an opportunity to “invest in kids”. On Thursday, November 10, 2016, the Supreme Court of Canada heard an appeal from teachers to overturn the BC Appeal Court decision that sided with the Liberals: a decision that questioned whether the BC Liberal Government had violated Charter rights for teachers… for a second time. At the Supreme Court of Canada hearing, the judges didn’t even bother to deliberate over evidence. After hearing opening arguments from the Liberals’ lawyer, the federal Court recessed for less than half an hour before ruling from the bench in favour of the teachers. The speed with which the ruling came down is the legal equivalent of laughing the BC Liberals out of town. But it’s no joke to British Columbians. The original court finding couldn’t be more clear: The BC Liberals violated the rights of some 40,000+ citizens. The ruling reads like a beat down of Christy Clark’s government, and exposes almost unbelievable duplicity: a government that used children as pawns in a political game; a government that made up false allegations against its own employees; a government whose policy was to “run silent and run deep”. Christy Clark’s signature is on the unconstitutional legislation. She was the Education Minister who proudly proclaimed it in the Legislature back in 2002. She might have been forgiven for her ignorance, but having once been told by the Court in 2011 that she had violated the Charter rights of over 40,000 people, she re-wrote the same legislation pretty much verbatim in 2012. And her reason for doing so was far from forgivable (See “The Supreme Court of Canada Decision Against Christy Clark’s Government and the Dark Story It Confirms“). She has slithered around this issue for 15 years now, leaving public education in unprecedented crisis: accruing millions of dollars in legal debts, and causing outrage and indignation of British Columbians as they are now on the hook for over $300 million a year in court-ordered restoration of old contract language. Christy Clark has never been interested in “investing in kids”. She has decimated public education: closed schools and stripped support for the most vulnerable kids, all the while shrugging and smirking, and making outrageously false statements. Well finally the jig is up. Her treachery has been exposed, and confirmed by Canada’s highest court. It’s time for Christy Clark to go. “Technically”, the BC Liberals are not lying. Take a good look at the image below. Notice the pretty colours and the majestic provincial flag. The difference, of course, is that by saying the former, the government technically is not lying outright. They can’t help what people infer, right? They didn’t actually mean for us to see this as a proud policy announcement, right? And of course, the Liberals have to be careful to state that it is in their role as government caucus, and not government itself that they perform this little stunt. This keeps the opposition from being able to bring it up in the Question Period, because what the Liberal Party chooses to endorse outside of government is its own business. 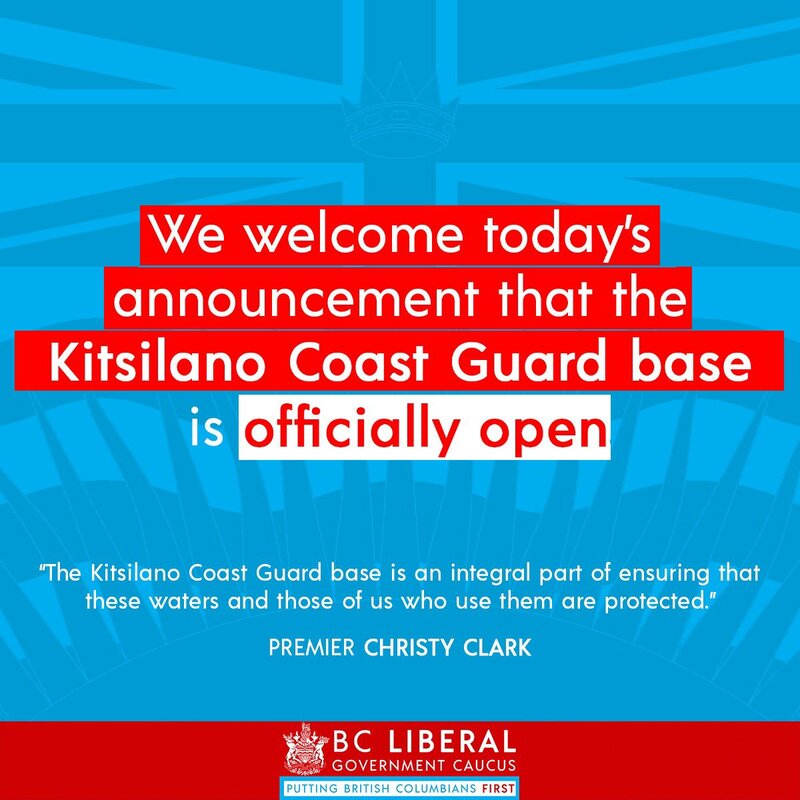 Because, as we all probably recall, the closing and subsequent re-opening of the coast guard station had NOTHING TO DO WITH the provincial Liberals. It is the federal government that controls this. It was just a few months ago that the Harper government caused outrage in the Lower Mainland when it shut down the very busy rescue station. Now the BC Liberals are trying to cash in on the warm fuzzy sentiment that will result from setting the issue to right. But it is a big deal. Clearly this is a Pavlovian attempt to pair warm fuzzy feelings with the BC Liberal banner. Instead of relying on solid policy to make them electable, the Liberals, who are down in the polls, are doing what they always do. They’re relying on stunts to win votes. They don’t govern. They only ever campaign. Passion-based learning? How about knowledge-based learning? In my Twitter feed, I just saw a tweet about an education seminar called “Passion-Based Learning”. So this is where we’re going in education? It seems likely. For years I attended seminar after seminar on student-centred learning. This seems like a natural evolution. It’s a bad idea. Because we care about our students, we want them pursue their passions in the hope that in doing so, they will feel more inspired to learn, and will happily pursue the skills and knowledge to take their passion to the next level. If a kid is interested in… say… go-carts, he’ll want to build one, and in doing so, he’ll be more keen to learn about physics: vectors, acceleration, friction associated with go-carts. At least, that’s the thinking. So in this model, we ask kids what they’re interested in. Then we tell them to decide on a project they’d like to do, that will satisfy their interest, and pull them into the world of knowledge. We’re looking for a hook to engage kids. And I guess this effort is fine except for a couple problems. The first is that kids’ passions are fickle, and there’s no evidence that their passion translates into better learning of tangential concepts. In other words, the kid who likes building go-carts just may not be terribly interested in friction coefficients, no matter how the concept is presented. Nor will his passion spill over at all into an important topic like English. The second is that focussing only on our passions creates the illusion that our passions are important. They’re not. At least, they’re not as important as the overall society. We should not suggest to students that school, which is their first experience with society at large, should bend to fit their passions. Students need to learn the importance of self-discipline and self-sacrifice. A kid needs to forgo his passion to do his homework. We need to make sure that students are aware that their job is to somehow become useful contributors in society, and that just because they’re interested in something doesn’t mean it’s a priority. Passion should not be the basis for learning; knowledge should. We hope that knowledge will speak to students’ passion. In fact, we know that the better we equip a child with knowledge, the more we open the door to many interests (passions if you will). Good teachers have always tried to hook students into learning a new concept by first accessing prior knowledge, and even (Yes!) prior passions. But to allow students to choose what they learn, and to have to try to somehow sneak knowledge in according to what the students’ passions impel them to choose to study is backward. Please don’t think that “badass” is a good qualification for a cabinet minister. An opinion piece by Stephen Marsh (Esquire.com), discusses the cool factor of Canada under a Trudeau government. The article is humorous –a little tongue-in-cheek to be sure, and not objectionable, really. But aspects of it pushed a button with me. The article ascribes to our new defense minister, Harjit Sajjan, a tough-guy credential, preferring this (perhaps playfully) to “running think tanks, or teaching at universities” –as if killing Taliban fighters is somehow a better qualification for a Cabinet Minister than being an intellectual. The article compares Sajjan to movie action hero, Jack Reacher. Notwithstanding the overall message of the article, it brushes against a theme that doesn’t sit right with me. I’m tired of the diss of intellectualism. Just who the hell is Jack Reacher, and why the hell would we want someone like him in our government? Killing Taliban (or killing anyone) is not something that should impress. Rather, it’s something that should depress. In the world today, there are far too many people killing each other. The dichotomy of “us” and “them” is far to entrenched. Whatever has necessitated our young people to range themselves as infantry against other young people in deadly conflict is a tragedy. I don’t have a problem with the appointment of Sajjan. For all I know, he is eminently qualified to be Minister of Defense. Certainly his experience in the military can be an asset to the job. But when I pin the poppy to my lapel, an association of the word “badassery” with the proud military history (of which my grandfathers and grandmothers were a part) feels like so much blasphemy. The word diminishes them in some way: men and women who preached and lived gentleness and who thought “intellectual” to be a great compliment –men and women who survived a terrible, terrible war, and who fervently wished that their children’s children never experience war again. Men and women who told me that the “bigger man” was the one who walks away from a fight. “Cute” is the right word to contextualize this article. I get the joke, but I have a real fear that among Canadians there is a large element of macho-shithead-ery that would prefer badassery to a sober, nuanced, intellectual approach to a very serious portfolio. Stephen Harper: He hid in the closet for all of us. As the 42nd Canadian federal election nears, I think about a particular defining moment of Stephen Harper’s leadership. It came when a mentally ill gunman, Michael Zehaf-Bibeau, rampaged through the parliament buildings. I don’t wish to make light of this incident; it would have been terrifying for all involved, and certainly devastating for those close to the victims. But it happened, and while it was happening, the course of action the Prime Minister chose was to hide himself in a small storage room. This action of the PM offers a glimpse at the man Stephen Harper is. What went through his mind as he hid away in this dark room while chaos reigned outside? Of course, true to form, he won’t say. This leaves us to speculate. If there’s one thing we know about the Prime Minister, it’s that he is very concerned about “Islamicism” (a word that he himself coined). I used to think that Harper presented the idea of Muslim extremism (George W. Bush style) as a way to leverage fear in order to secure votes. The fear had to be manufactured because Canada, like most countries, has had almost no trouble with Islamic extremism, but that fact hasn’t dissuaded the Prime Minister. In virtually all of his speeches, he emphasizes a threat of jihadist terrorism. I say I used to think he was leveraging this stuff, but I’ve changed my mind. I think Harper actually believes that crazed jihadists are everywhere, lurking in the shadows, just waiting for the opportunity to pounce on and “radicalize” some sweet, clean cut kids who are innocently trolling Youtube, and convert them into frothing, deranged suicide bombers. The attack on Parliament gave Harper all the evidence he needed to justify his belief that “Islamicism” is a real threat. He now had assurance (if he ever needed any) that Canada needs to insulate itself against “Islamicism”, even if if we have to surrender some of our basic freedoms to do so. It is for our own good. He definitely wants us to be afraid. It would be convenient for Harper’s detractors to believe he hid in the closet out of cowardice, but I believe differently. I believe that, all of his jihad fears confirmed, Harper fantasized somehow that he, being the Prime Minister, had to preserve himself for the good of the country, just like in the film “Airforce One” when the U.S. president, played by Harrison Ford, ducks into hiding aboard a presidential airplane overrun by hijackers (foreign extremists, of course! ), so that he can use his superior cunning and stealth to thwart the plans of these evil bloodthirsty villains, and save his family and America too. Think about it. Without warning, shots ring out in the parliament building. Harper must have been thinking, “This is it. We’re at war!” It was just as he had suspected; the terrorists had finally launched their attack. It was essential that he preserve himself so that he could emerge from his bunker and lead his people to victory! He was probably thinking about how during times of attack, it is the policy of U.S. presidents and vice presidents to go underground in separate locations. He had been right all along, and the lazy unionists, the egghead intellectuals, and the hysterical feminists had missed the big picture! It would now be up to Harper alone to lead the good people of Canada; he alone would protect us all. The people can’t be trusted to manage all this on their own. Harper must endure! He hid in the closet for all of us. In case you’ve never thought about this, here’s proof of how the government strategizes for interviews. Always deflect the question by stating something positive about your past record. Don’t actually answer a question. Traditional conservative and liberal values are being replaced by a frightening new politic –a new liberalism (“neo-liberalism”). It’s a phenomenon that is causing western society to devolve from strong free-market democracies into a type of modern feudalism. New-liberalism disguises itself as conservatism, because like conservatism, it moralizes over behaviour, but in the sense that it lacks vision, it is different. To understand this new liberalism, we first need to consider the meaning of traditional conservatism and liberalism. At the heart of conservatism is the desire to to manage ones affairs with prudence and temperance; to delay gratification and live within ones means. As a political ideology, conservatism is visionary. It seeks to prescribe morality through law in order to protect people from themselves, thereby ensuring a safe, equitable world in which everyone has the ability to profit. Conservatism is a vision for society in which we can profit collectively by creating a rigid structure that demands individuals act responsibly, and therefore have the ability to prosper individually for the general good of the society. Therefore, conservatives believe in fairly rigid criminal codes, governing people’s behaviour. They are morality-based and restrictive for people’s own good: for example, laws that prohibit drug use. This ideology is not without its detractors. Liberals object to conservative’s moralized worldview. They argue that the government has no right to tell individuals how to behave, and liberals are particularly resentful of policy that discriminates against individuals and blames their plight on “bad” behaviour. And so traditional liberals tend to take a more humanistic view of society, demanding that social structures be put in place that allow people more individual freedom: for example, universal health care. As a political ideology, conservatism would demand that governments regulate financial institutions in such a way as to ensure their solvency. So, for example, a truly conservative government would abhor the thought of mortgage-backed securities, which are investments in debt, and as such, are inherently risky. Conservatives would have ethical concerns about the pyramidal shape of investment that was founded on a presumption that property values would escalate forever. Conservatives would have been concerned about how those increasing values were far outpacing the trend of the rest of the economy. A true conservative would predict that this cycle would eventually correct itself, and would be loathe to risk money on it. As a matter of fact, Canada, through some fairly conservative regulatory policy, managed to escape the trauma that many nations faced when the mortgage-backed securities crisis hit in 2008. In hindsight, liberals’ objection to mortgage-backed securities was that the collapse of the market led to a situation in which the consequences of bad policy were felt most acutely by the people who, lured by unscrupulous brokers, assumed debt they couldn’t afford. To liberals, it was unconscionable that the most vulnerable in the scenario lost everything, while the rich got bail-outs and golden handshakes. Neither conservatives nor liberals would wish to see CEOs earning twenty times more than employees of their own company. This kind of profit skimming would not be seen as prudent by conservatives, and it would not be seen as fair by liberals. Nor would it escape the notice of either conservatives or liberals that corporations’ profits go toward lining the pockets of a few very wealthy people rather than trickle back into the greater economy. Both liberals and conservatives would expect the profitability of industry to benefit the nation as a whole. And therefore, they might insist through policy that corporations re-invest in the economy of the nation where they do business. Globalization is not necessarily a “conservative” policy. Neither conservatives nor liberals would wish to see governments propping up large corporations with government hand-outs. Spending of tax dollars on corporations would be seen as risky by conservatives, and elitist by liberals. To conservative thinking, entrepreneurialism is a private matter that should not rely on handouts from government. This attitude would stem from the conservatives’ moral code which would say that one shouldn’t live beyond his means, and this missive would apply to corporations. To liberals, the corporations would be seen to have a responsibility to the society at large, and therefore should not receive government subsidy which would necessarily limit government’s ability to finance humanitarian social structures. Conservatives , like liberals, also recognize the need for public ownership of some things. Education, for example, is seen both by liberals and conservatives as a mechanism for ensuring that everyone has an equal chance to succeed in a market economy. Conservatives would see public education as an investment. Conservatives do not necessarily see government ownership and regulation of various industries as a bad thing, as long as ventures are well-managed. Although conservatives might be likely to mistrust government in managing industry efficiently, they would have no philosophical opposition to public ownership of such things as the power grid and the communications grid. After all, it may not be prudent to trust such necessities of life to the whims of a profit-driven corporation. Although it is liberals to whom we ascribe concern for social problems, true conservatives do not hide from real issues. For example, a true conservative, seeing the inevitable environmental calamity caused by our dependence on petroleum and fast food, would enact preventive measures to mitigate the crisis. He would enact strong policy to try and stop this. To ignore scientific evidence is not the kind of folly one can attribute to a liberal or conservative worldview; it is simply folly. Similarly, the devolution of our socio-economic structure in general is not one that we can attribute to a preponderance of liberal or conservative values, though at least partly to blame is the tendency to moralize, which is a more “conservative” tendency. Today’s realpolitik is a new liberalism, one that liberates individuals without regard for the consequences to the society at large. The new liberalism is fiscally irresponsible, treating corporations as individuals, and staying out of their business, allowing them to profiteer without demanding that they contribute to society, and without regard for environmental impacts or the human misery that their policies engender. New liberals espouse laissez-faire policy. They strike down labour laws that prevent corporations from taking advantage of vulnerable workers. They exonerate corporations from paying taxes, and wash their hands of social issues like poverty, health and education. Many of these new-liberals brand themselves conservatives, because in the name of efficiency they seek to privatize anything that is publicly owned, but they are not really conservative in the sense that I propose here. Steven Harper’s Conservative Party of Canada is a prime example of a party of new-liberals. Far from a visionary ideology, the new liberalism lacks vision. Attached to this new liberalism is an ugly selfishness –“get it while you can, and bugger everyone else” mentality. Paradoxically, this liberalism holds on to some traditionally conservative moral thinking, but it lacks compassion and it willfully blinds itself to truth, muzzling intellectuals and de-funding demographic and economic research. It assumes that the poor deserve to be poor, and therefore takes no interest in the plight of individuals within a society. So what happens is that unchecked, the powerful prey on the weak. The powerful multinationals, whose only motivation is profit, and who have no interest in the success of the country they exploit, ensure that government allows them carte-blanche –often to the detriment of society at large. They do this by using their considerable wealth to back politicians who will give them free reign. This new liberalism is a scourge to the whole world. We now see politicians as lapdogs for the corporate elite, enjoying black tie dinners and limo rides as long as they adopt the corporate strategy as their political agenda. There is no vision here. I am writing to express my concern about the proposed Mother Canada memorial, which is to be placed in a national park at Green Cove. As much as I support art, even art that is controversial, my support does not go so far as to allow an endeavor of human beings to impose itself on the pristine natural beauty of a national park. We have a National Parks Act written to prevent just such an intrusion on the park. As for the art itself, I am opposed to it per se. It has not been conceived by an artist, but by a businessman. It is concerning to me that in the conceptual phase of such a project, we’re already talking about “marketing potential”. This, in my mind, somehow detracts from the principles for which our soldiers fought, and it debases the artistic purity of the work. One trait I like to lay claim to as a Canadian, is subtlety –a reluctance to glorify ourselves above noble ideals. In my mind, our military commitments have never been for the glory of Canada, but have been humanitarian in nature. This is one of the traits I embrace as a Canadian. I worry that the statue as it is currently envisioned is a clumsily conceived monument to vainglory. I agree with John Greer’s analysis that as an abstraction of “Canada Bereft”, the work is conceived out of sentimentality, rather than pure sentiment. It is the latter that should inspire art, not the former. Therefore, as a work of art, Mother Canada limits itself to being a poor imitation of something unique and beautiful. It somehow cheapens Canada Bereft in my mind. Lastly, as a monument that is placed on a Canadian shore, it (in its present design) would completely disregard the long heritage of Canada’s First Nations. It is very European in its style, and speaks only of our participation in European ventures. Its permanence as an image on Canada’s shore seems to me to cement an understanding of Canada as a descendant of, and continuing participant in European colonialism.